Bitcoin mining giant Bitmain last week launched a new cryptocurrency index which tracks the performance of top cryptocurrencies, CoinDesk reported. 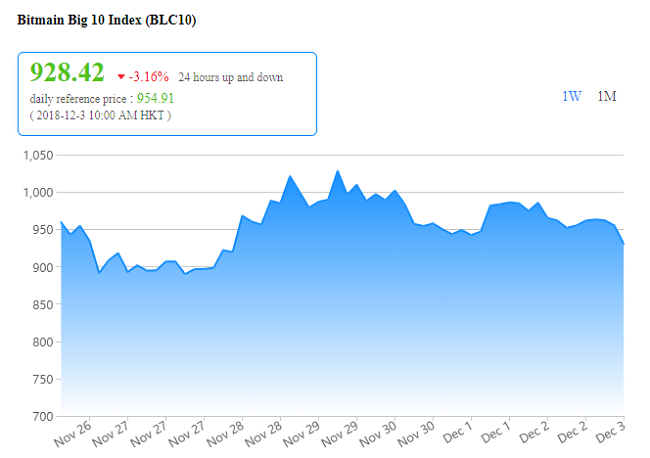 The Bitmain Crypto Index publishes two types of prices – a Real-Time Price which is updated every second, and a Daily Reference Price which is updated daily and published around 10:00 a.m. Hong Kong time every day. “The Bitcoin Digital Currency Index (“Index”) is a transparent, immediacy, representative, and methodologically based index product designed to meet the market participation and investment needs of institutional and individual investors. The index tracks the performance of the largest and most liquid digital currency in the market and is denominated in US dollars,” the description reads. Currently, price data collection sources include Bitfinex, Binance, Bitstamp, Bittrex, GDAX, Gemini, Huobi (Fire Coin), Itbit, Kraken, OKEX, and Poloniex. “The index is developed to provide institutional and retail investors with transparent, timely, methodology-based, and investable benchmark of the most active cryptocurrencies traded globally,” Bitmain said (as quoted by CoinDesk). In case any of the listed tokens undergo a hard fork split, Bitmain clarified that “a hard forked new token will be measured against a set of criteria on its 10th day post-fork to determine whether it is a significant one” to add.